In 2011 Texas became the latest state to make the Choose Life plate available. The Choose Life plate is now in 25 states and has raised over $14 million for the cause of life and adoption in those states. 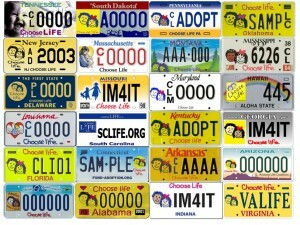 We have started new teams in Maine, Michigan, Wisconsin, Rhode Island and Iowa and in 2012 we expect our past & current efforts to result in Choose Life license plates in Maine, Michigan, Wisconsin, Iowa, Alaska, North Dakota, and possibly New York & North Carolina. But, there is still a lot of work to do. We are making plans to meet with pro-life groups and individuals in California, Colorado, Idaho, Illinois, Iowa, Kansas, Michigan, Minnesota, Nebraska, Nevada, New Mexico, Oregon & Washington. It is important that we keep our activities going in these states to see our successes continue. Our current transportation is a nine year old van, which is pushing a quarter million miles. We need to buy a used van for our efforts and we need to raise the rest of our 2012 budget year funds. We still need $25,000 to accomplish this travel and operate Choose Life America, Inc. for 2012. All donations sent by February 29, 2012 will be matched up to $15,000! Please take this opportunity to double your donations and ensure that Choose Life America can continue to spread beyond the 25 states currently offering choose life plates. You can mail a check to Choose Life America, Inc.; PO Box 830152; Ocala, FL 34483-0152 or donate online at our website ChooseLifeAmerica.org. We request any donation over $1,000 be by mail to save us the online charges we have to pay. Choose Life America, Inc. is an IRC 501(c)(3) tax exempt corporation and donations are tax deductible. If you would like more detailed information, just let me know. We pray God’s great goodness and blessings upon you and those He has given you to care for as you seek to serve Him. Russ Amerling and his wife Jill have been full-time volunteers for Choose Life America since 1997.